Leader of the Opposition Andrew Scheer speaks with the reporters as Conservative MP Michelle Rempel, left, looks on following Question Period in Ottawa, Ont., on Tuesday Dec. 4, 2018. Canadian academics and refugee advocates are calling out the federal Conservatives for spreading misinformation about the implications of a United Nations migration agreement, which Canada will join in Morocco next week. International law and global affairs professors from the University of Toronto and McGill University held a video conference with reporters Friday to explain the Global Compact for Migration and rebut Conservative Party claims that the agreement will force Canada to give up control over its borders and immigration policies. The first-of-its-kind agreement has become the subject of a contentious political debate in Ottawa, with the Tories urging Prime Minister Justin Trudeau’s Liberal government not to sign the pact. 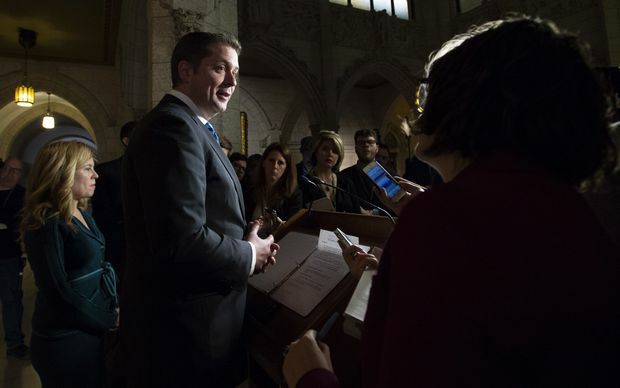 Conservative Leader Andrew Scheer held a press conference on Parliament Hill on Tuesday, where he criticized the government’s support for the Global Compact and said Canada should have full autonomy over who it lets into the country. Craig Damian Smith, associate director of the Global Migration Lab at U of T’s Munk School of Global Affairs and Public Policy, said the Conservatives’ claim that the Global Compact threatens Canada’s sovereignty is “logic-defying,” as the agreement explicitly reaffirms the right of member states to determine their national migration policy. He said the Conservatives either don’t understand international law or are willing to make false claims. “Members of Parliament in the federal Conservative Party are mimicking and importing far-right political rhetoric from Europe. Their arguments are cut and pasted from xenophobic and self-described de-liberal political parties," said Prof. Smith. Audrey Macklin, a law professor and chair in human-rights law at the University of Toronto, said there are no formal requirements when nations sign on to the Global Compact because it’s not an international treaty or convention. Immigration Minister Ahmed Hussen will travel to Marrakesh, Morocco, on Monday to join other countries in adopting the Global Compact. The non-binding agreement aims to mitigate factors that drive migrants out of their home countries, reduce the risks they face if they are forced to leave and create conditions that allow migrants to contribute to society. “It attempts to influence how our free and independent media report on immigration issues," Mr. Scheer said on Tuesday. However, Rob Oliphant, a Liberal MP and chair of the House of Commons immigration committee, said the section is not intended to target Canadian media. There are currently more than 258 million migrants around the world living outside their country of birth, according to the United Nations, and that number is expected to increase with population growth, global connectivity, climate change and rising inequality.